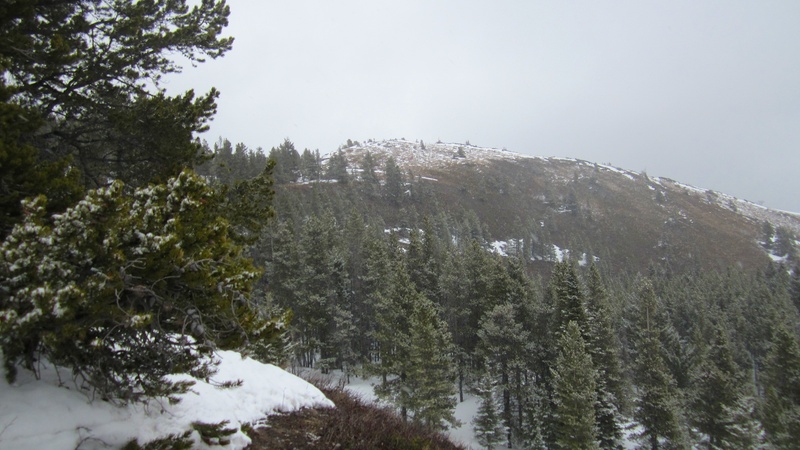 Most of Mount Backus lies just inside the Castle Crown Wilderness Region boundary. 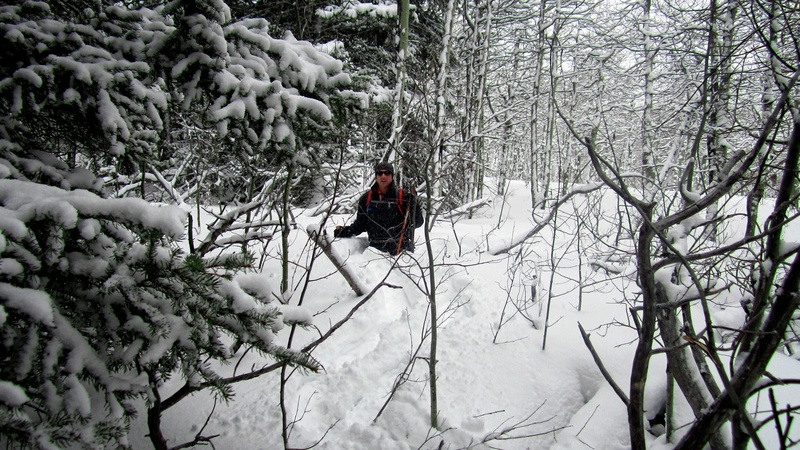 This was my second attempt this year to snowshoe up little Mount Backus. Back in February, it was really an afterthought – a back pocket plan pulled out in haste to salvage a day of poor weather. 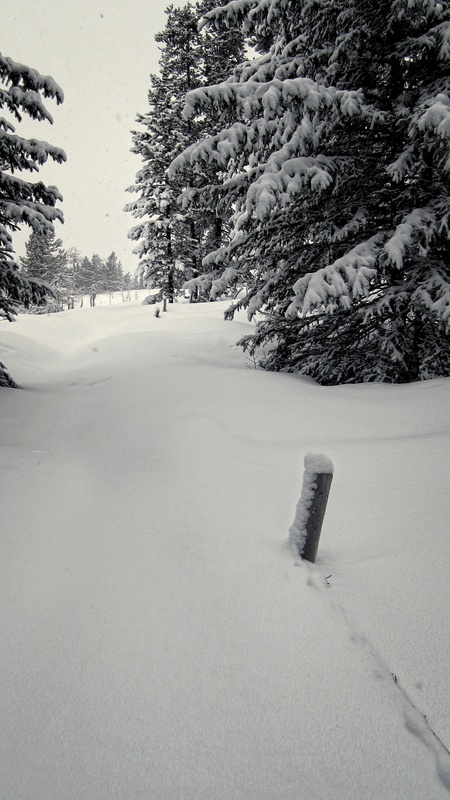 However, deep snow hampered our plans and we were forced to turn back. Since then, my inner Abraham Lincoln had kept whispering to me, “My great concern is not whether you have failed, but whether you are content with your failure.” So, with the avalanche threat still high elsewhere, I knew I had to go ‘Back to Backus’ and finish the job. I am glad however, that our February Keystone Cops attempt not only amused but encouraged Bob Spirko, Dinah Kruze, and Sonny Bou to successfully summit Mount Backus one month after our initial attempt. You can find Bob and Dinah’s trip report here and Sonny’s here. 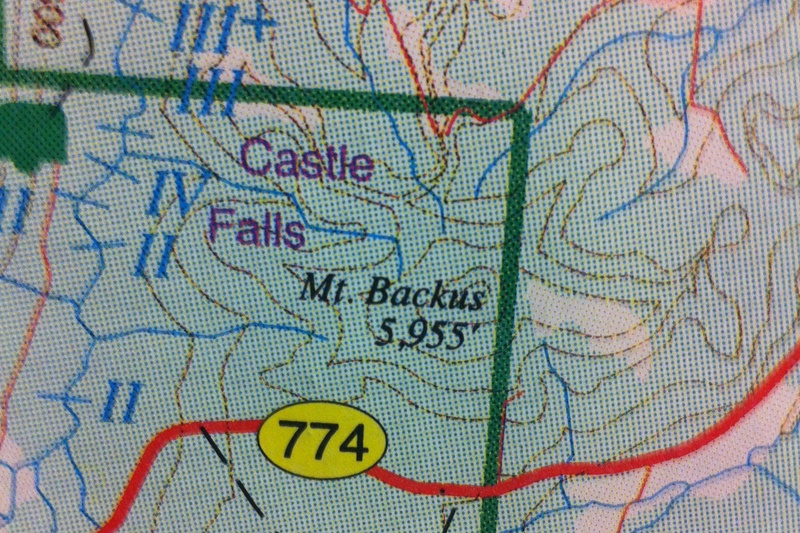 Unfortunately, neither Jeff nor I could coordinate our schedules to plan a return trip to Backus. Coupled with this, not being able to get out and hike for almost 2 months was driving me crazy. So, when my friend Graham had an afternoon off that matched with a free afternoon of mine, I knew where we were headed. With rain and snow once again in the forecast, we weren’t sure if we’d even be able to hike at all, especially when we pulled into a wet and dreary Beaver Mines around 1:15pm. Thankully however, after driving another 10 minutes down the road, the weather let up and we were able to hike under a light snowfall that cleared as the day went on. 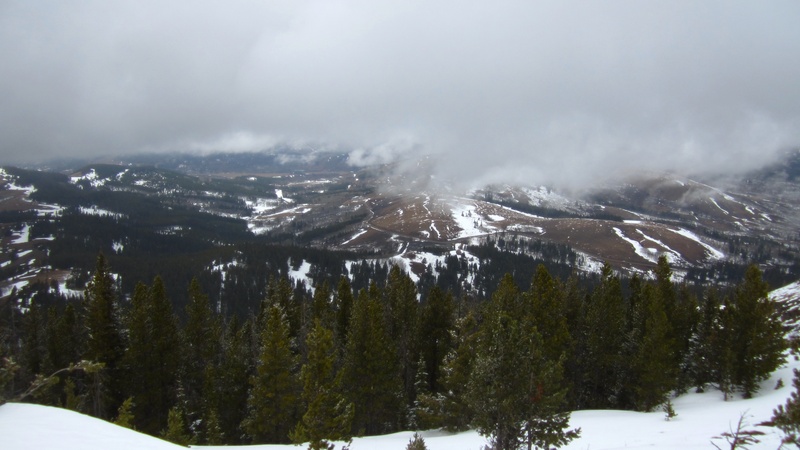 Despite the overcast skies, there was not a hint of wind, and the sun even tried to poke through on the summit. The temperature continued to climb throughout the day which meant that the snow (and there was still quite a bit of it) became wet and heavy, especially by the time we descended. We arrived back at our vehicle just after 5:30pm and by the time we drove the 10 minute stretch back to Beaver Mines, we were once again enveloped in a downpour that lasted all the way back to Lethbridge. Mount Backus it seems was just on the other side of the low pressure system that had settled over most of southern Alberta. Yes, it was a good day indeed. Being a somewhat stubborn individual, I chose to follow the identical route as our February 17, 2014 attempt. This meant that we parked at the horse staging area off of highwway 774 and next to the new (and rather unfortunate) logging access road. 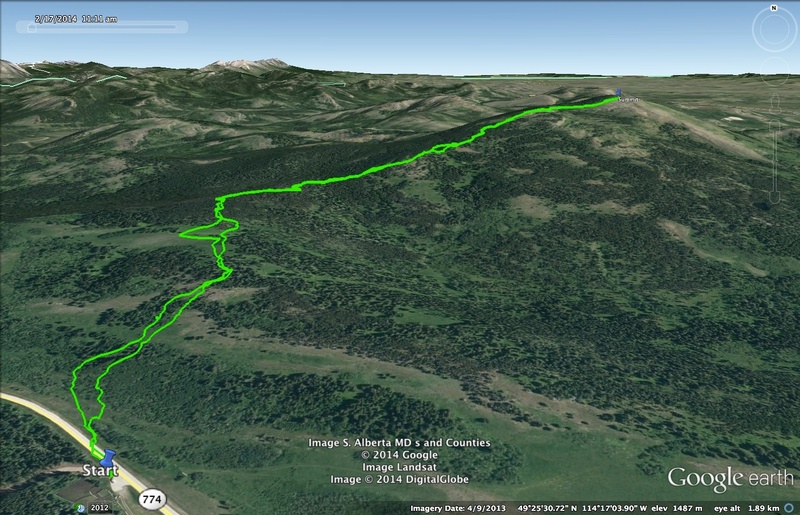 Our total distance was 6.7 km with a total elevation gain of 450m. We began hiking at 1:30pm and made it to the summit in 2 hours. We then spent about 30 minutes on the summit before arriving back at the car at 5:38pm for a total hiking time of 4hrs and 8min. These two pictures show how much snow has melted since my first attempt with Jeff almost 2 months ago to the day. Although not the exact location, they are in close proximity to each other. 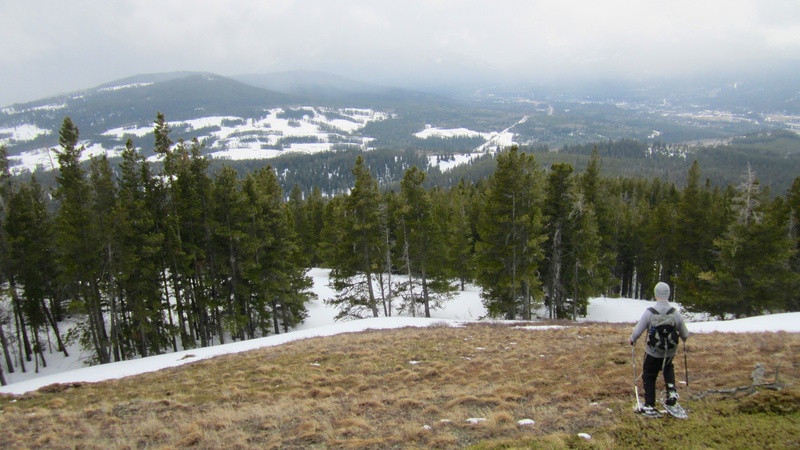 This time there were significant sections near the beginning that were clear of snow. 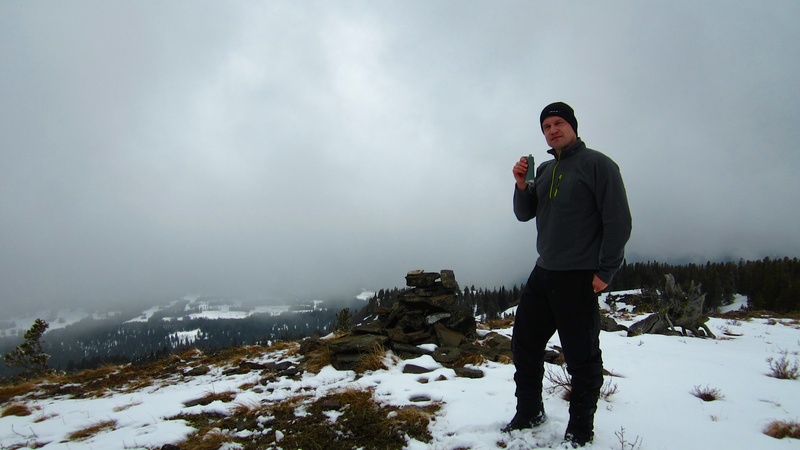 Table Mountain is barely visible in the background behind Graham (bottom picture). 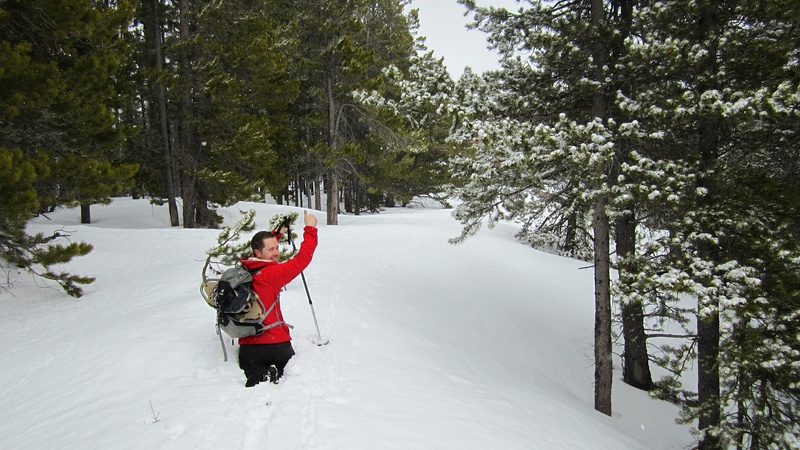 Graham hikes through a patch of snow near the bottom. 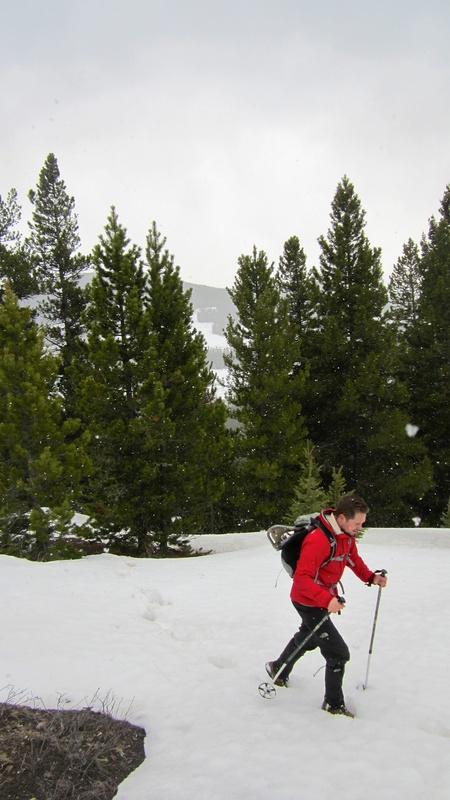 At this point, there was no need for snowshoes, but that would soon change. 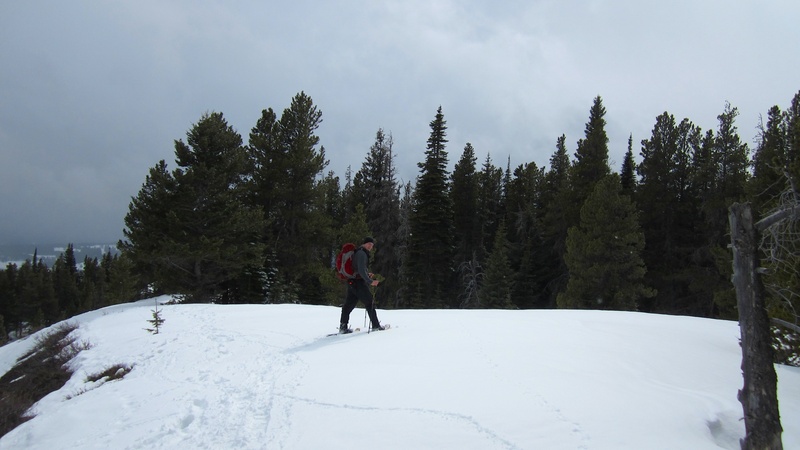 It was time to put on our snowshoes near to where Jeff and I encountered waist deep snow back in February. 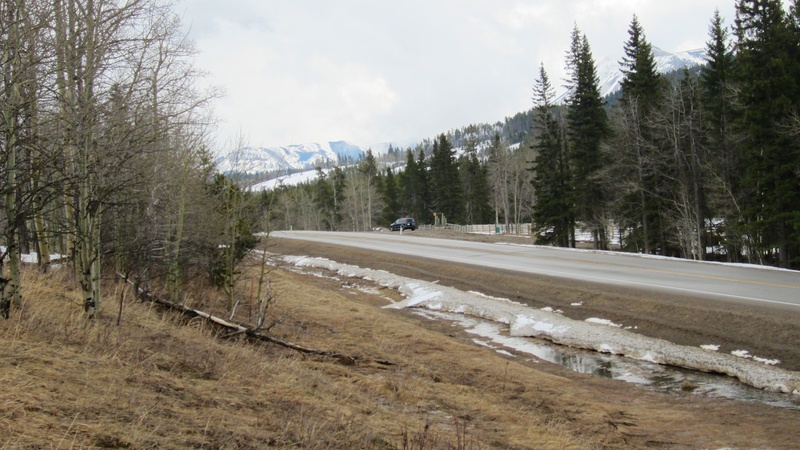 As you can see, a significant amount of snow has melted since then and some of the previously buried fence posts are now visible. 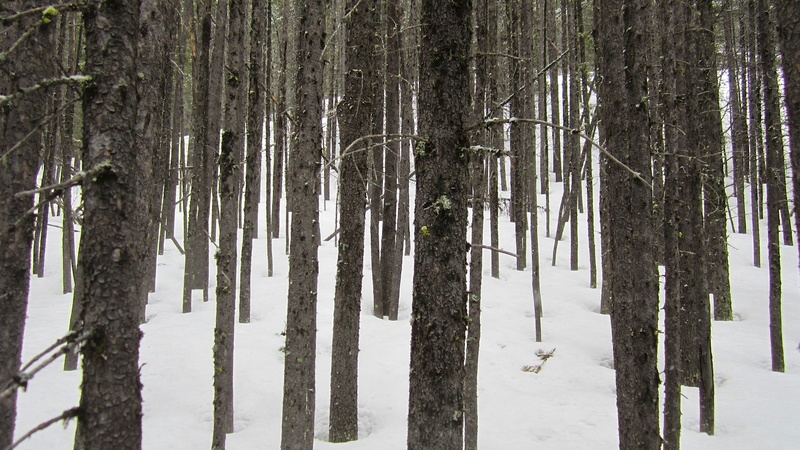 As we entered into the trees, the snow became deeper, and to make matters worse, the warm temperatures made it feel at times like we were walking through wet cement. 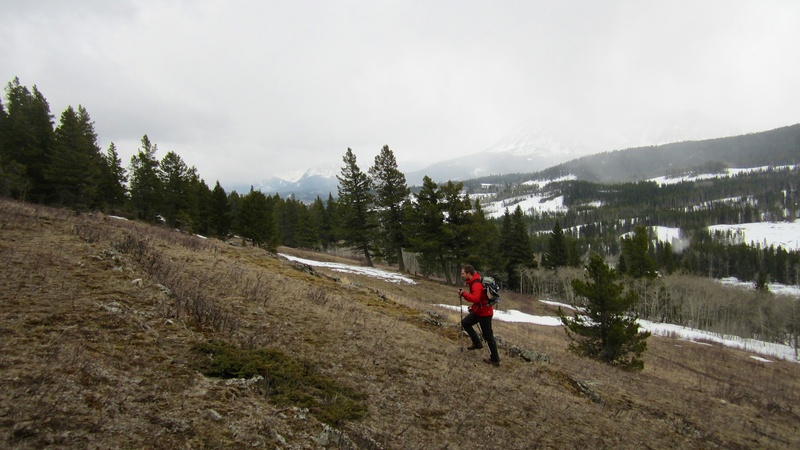 Having grown up west of Calgary on land that was entirely forested, I kind of enjoy navigating my way through the trees – which I guess is a good thing, since much of the route up Mount Backus looks like this. However, if you want to avoid some of these wooded sections, then I would suggest utilizing Bob Spirko’s route. 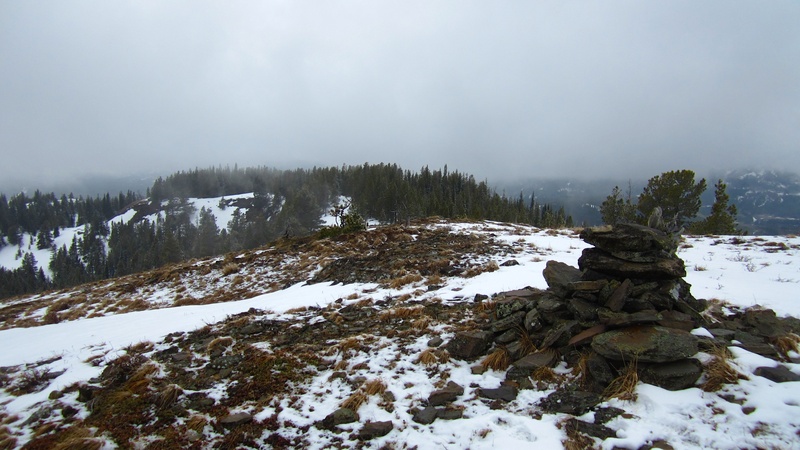 The summit of Mount Backus comes into view. As a salute to Jeff (bottom picture), who did not have snowshoes on our February attempt, Graham and I decided to forego our own snowshoes (top) for the final stretch before the summit. Our respect level for Jeff grew immensely after only a few dozen metres. 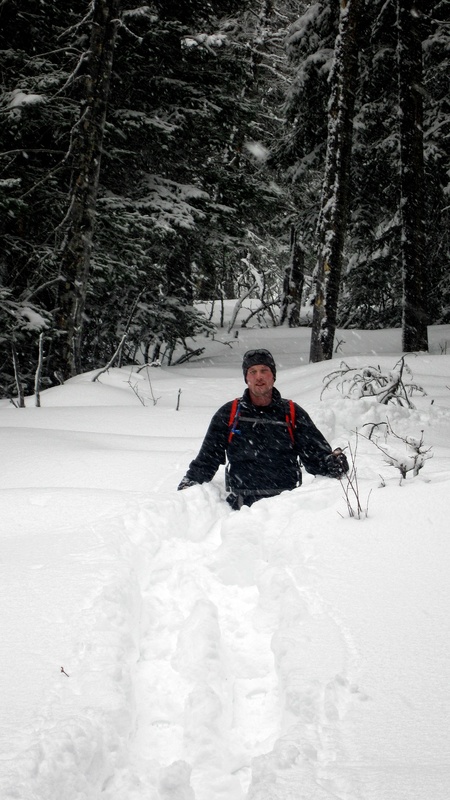 How he was able to make it as far as he did in snow that was even deeper than what we encountered is impressive. He truly is the Thor of journeyman commercial plumbers! Just don’t ask to see his mighty hammer. 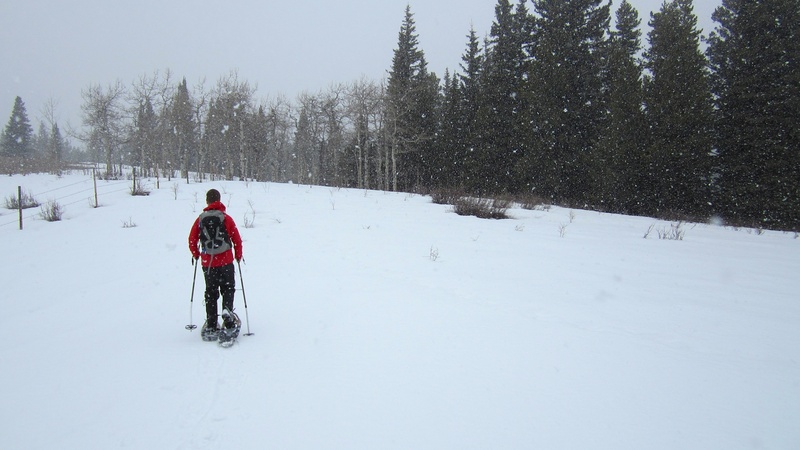 Finally on a firmer section of snow, Graham heads toward the summit. Graham on the summit of Mount Backus. Our ascent route followed the open sections in the trees on the right hand side of the picture. Me on the summit. There was not a hint of wind all day and the temperature was beautiful. I blame my friends Brad and Dave for this picture. They are the ones who introduced me to the ‘summit toast’ during our hike up Mount McLaren last fall. 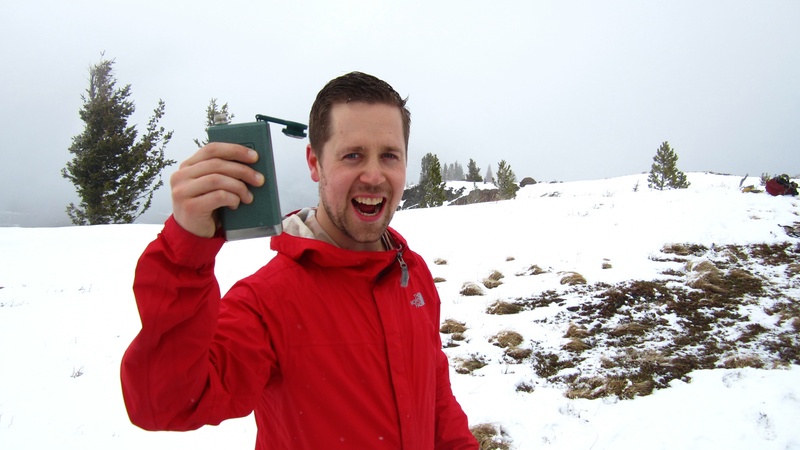 My wife further enabled this new tradition by giving me my own hiking flask (pictured) for my birthday this year – which I was then compelled to fill with 12 year old Scotch. 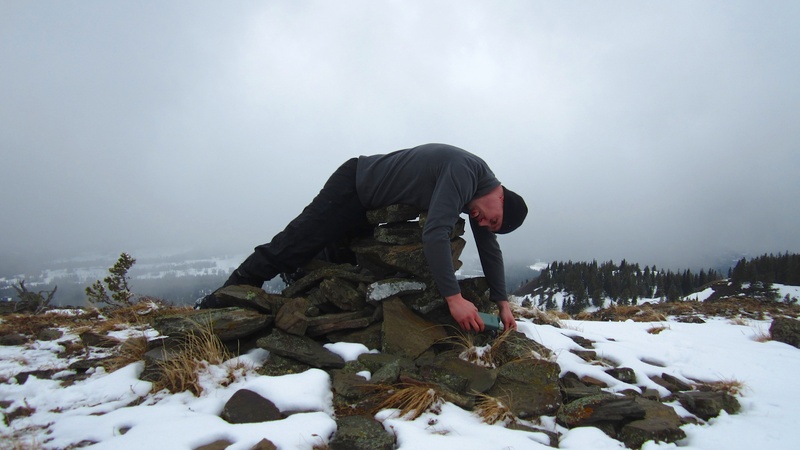 I’m not a big drinker at all and I definitely do not advocate drinking and doing anything in the backcountry, but there is something to having a wee nip to celebrate a summit. 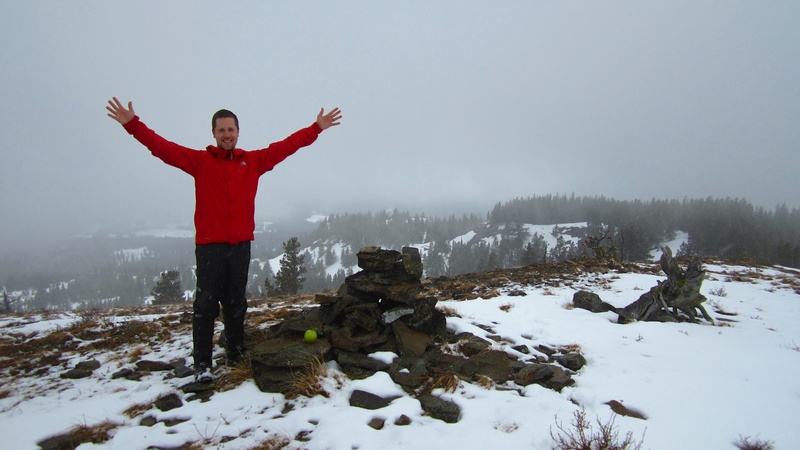 Our summit toast was in praise of Jeff and his valiant efforts on Mount Backus earlier in February. Lesser men would not have made it as far as he did and fortunately, he himself did not become a lesser man because of his trek over upwardly pointed, snow covered deadfall. We salute you Jeff! Wow! 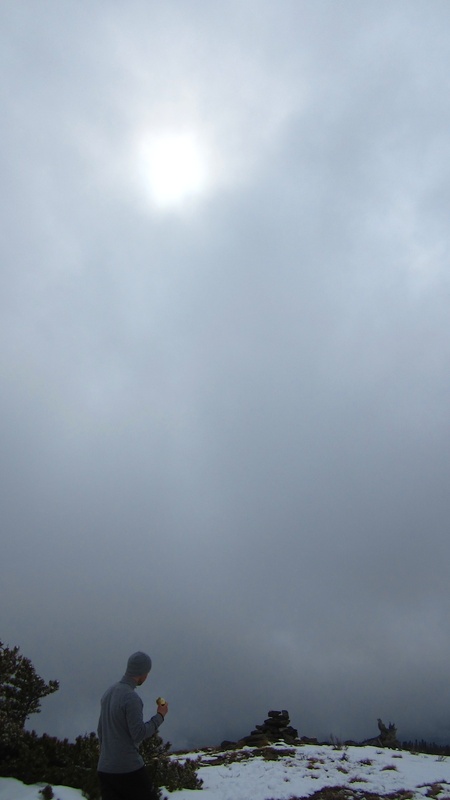 The sun actually tried to break through while we were on the summit. The only semblence of a view was to the southeast. 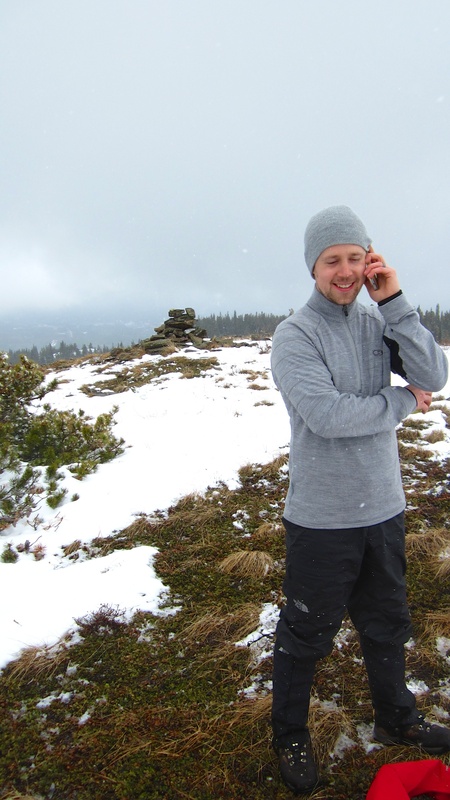 Always the consumate businessman, Graham wheels a deal while standing on the summit. 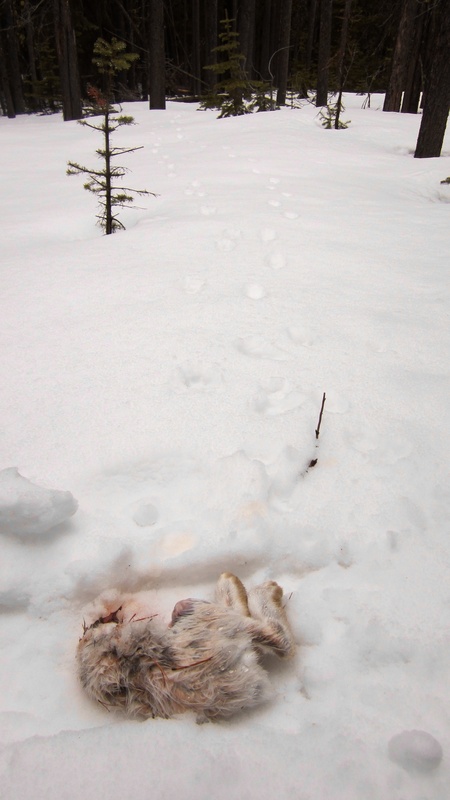 While there were a few bare patches, it was not worth taking off our snowshoes to cross them. 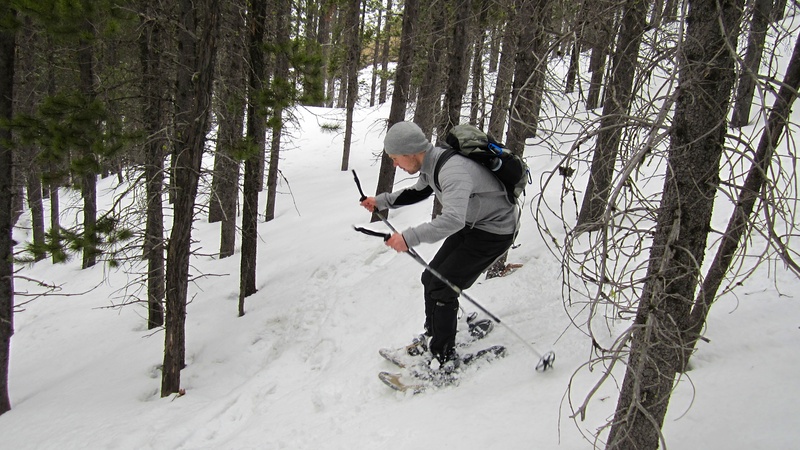 Graham snowshoe skis through the trees. 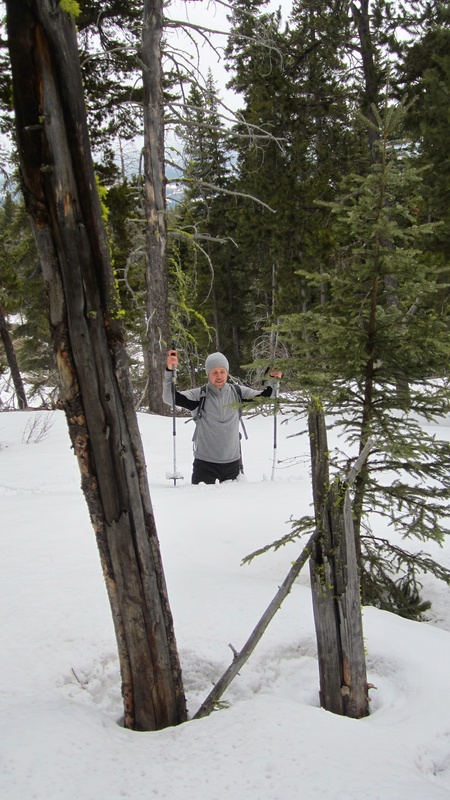 Yes, Graham is wearing snowshoes in this picture…. warmer temperatures later in the afternoon made for some tough slogging in parts. 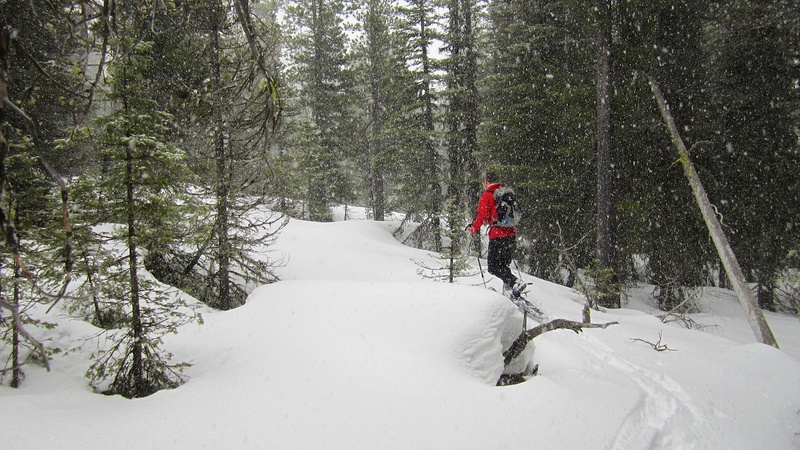 The sticky wet snow clung to our snowshoes and made each step difficult. The weather cleared somewhat to the south as the day went on. Here, Table Mountain appears through the trees. Carbondale Hill is in the foreground and Syncline Mountain is behind and to the left. To date, Syncline is the only ‘real’ mountain that I’ve failed to reach the summit of. 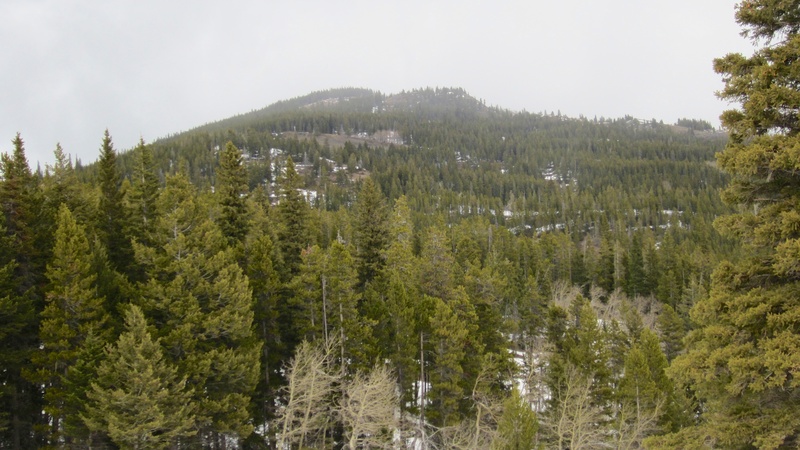 It was the summer of 2012 and my two sons and I had made it 3/4 of the way to the top when my oldest son suffered an asthma attack that was brought on by all of the bushwhacking that we had done to get to its base. Joel’s climbed numerous mountains and has never had an issue with his asthma, but on Syncline, it required us to turn back just before we hit the ‘rock gates’. 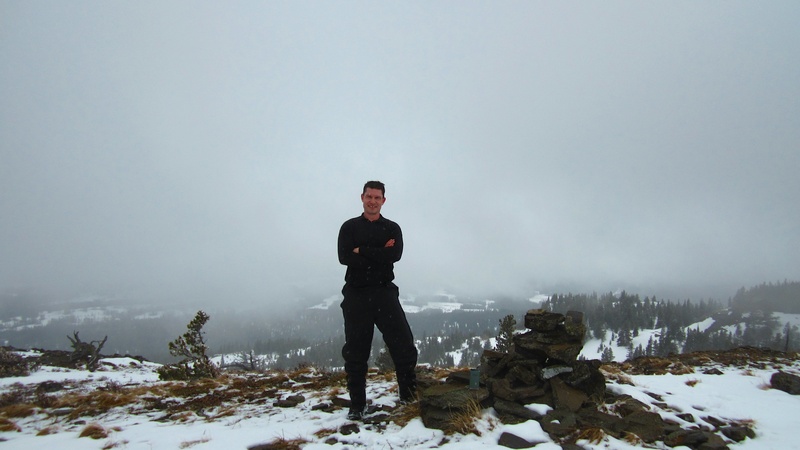 Also, unbeknownst to us at the time, my other son, Nathan, was climbing Syncline with an extremely rare tumour growing inside of his nasal cavity (juvenille angio fibroma) that would end up becoming the size of a lacrosse ball before it was diagnosed in January 2013. After 3 surgeries and another still pending (to fix the post-traumatic trigeminal neuralgia caused by the tumours), we’ve been on an unexpected journey over the past year and a half – with more to go. We are thankful for many things including our wonderful Canadian health care system, but I will save those details to write about in a separate post. 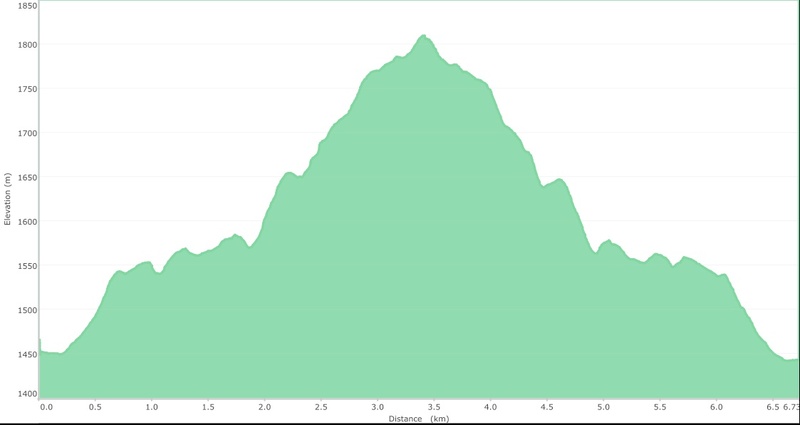 Edit: I was finally able to return to Syncline in 2014 and complete Peaks 1 and 2. 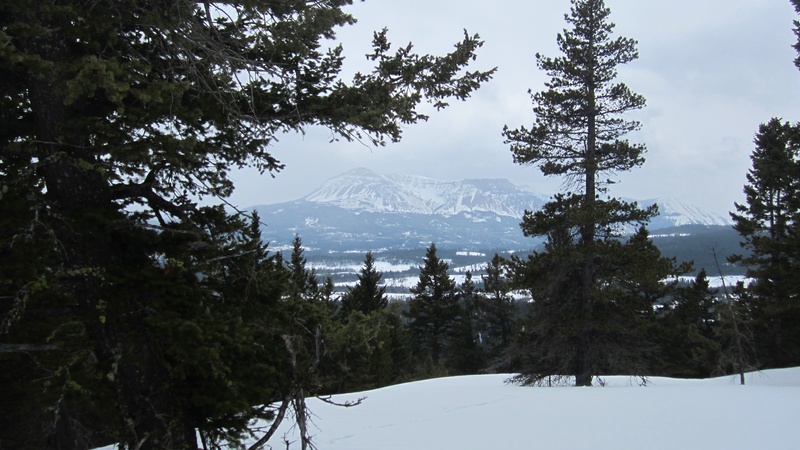 Graham looks south toward Syncline Mountain and Castle Mountain Ski Resort (Mount Haig & Gravenstafel Ridge). 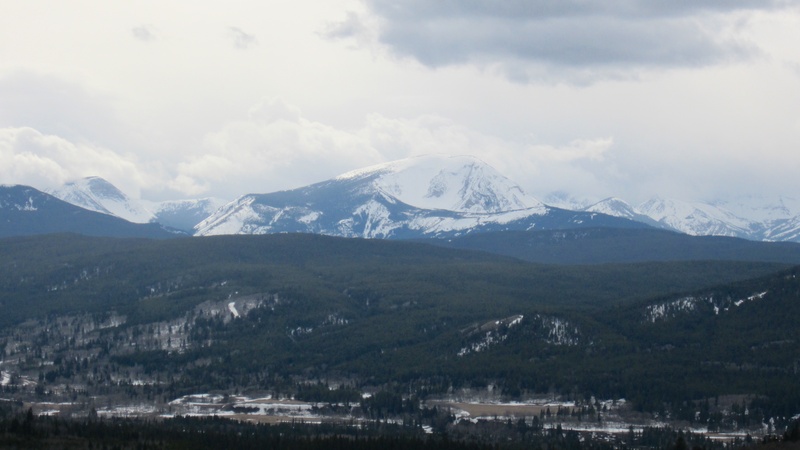 Southfork Mountain is on his left. Mount McCarty is on my ‘To Do’ list for this year. Edit – Done! Looking back at the main slopes of Mount Backus. Our route went up through the snow patches just left of centre. My return trip to Mount Backus was an afternoon well spent. 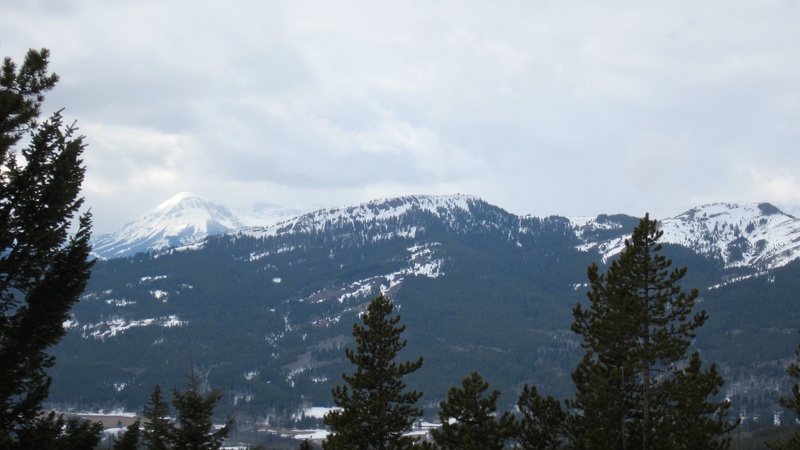 As I mentioned in my February post, I love all the little bumps like Mount Backus that adorn the Castle Crown and the Crowsnest Pass. 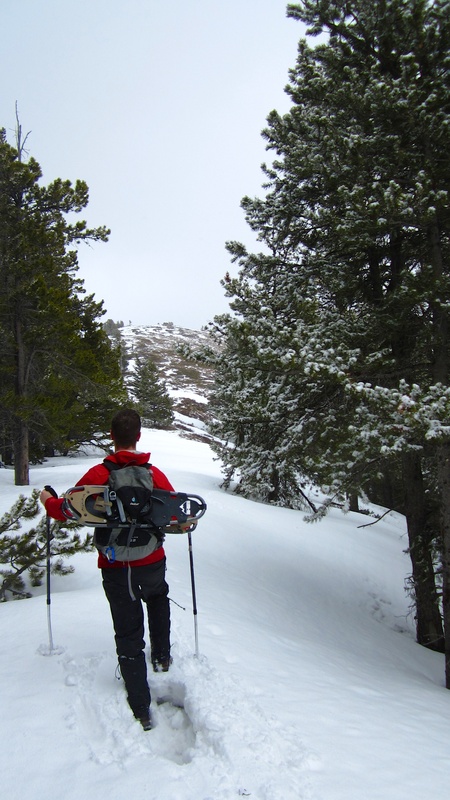 I’d probably never consider them as destinations in the summer and fall when there are ‘real’ mountains to climb, but for a winter excursion, they are a fun way to gain a summit and not have to worry about avalanches. 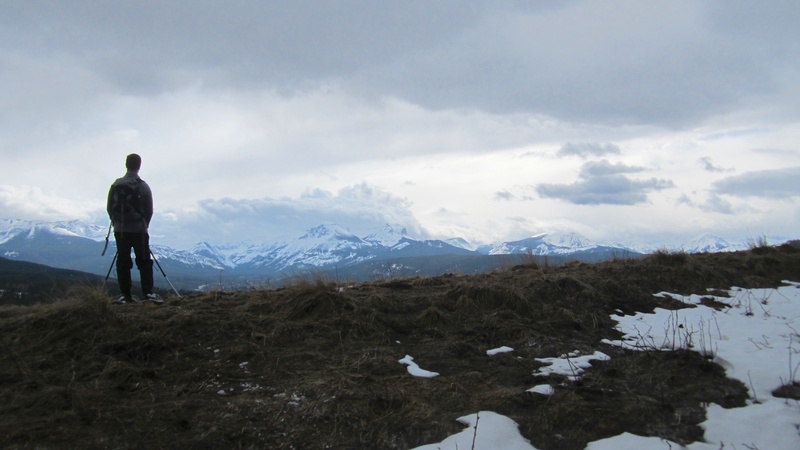 Besides, exploring off-trail in the winter adds an extra dimension of beauty to the landscape – even when the weather is less than ideal. With the amount of snow still in the mountains in mid-April, I would expect that my next outing will be a similar type of destination.